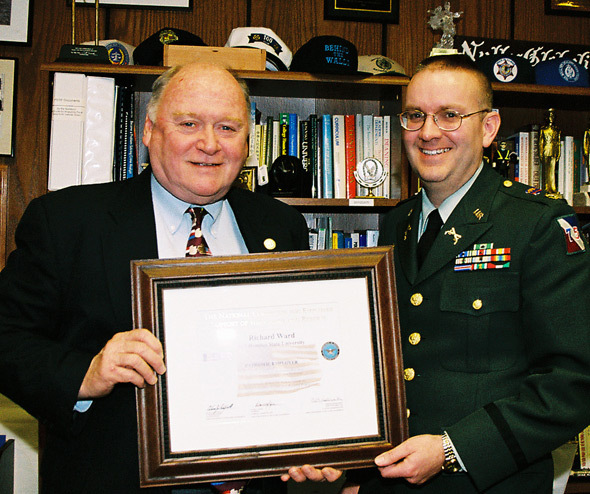 U.S. Army Reserve Major Willard M. Oliver (right) presents Richard H. Ward with the Patriotic Employer Award for Ward's support of the Guard and Reserve. Richard H. Ward, dean of the College of Criminal Justice at Sam Houston State University, has been presented with the “Patriotic Employer Award” on behalf of the National Committee for Employer Support of the Guard and Reserve. The award was presented on March 8 by U.S. Army Reserve Major Willard M. Oliver, a faculty member in the College of Criminal Justice. Ward was recognized for his continued support of Oliver’s secondary job as a major in the 75th Training Division in Houston. The National Committee for Employer Support of the Guard and Reserve is a Department of Defense organization that is tasked with helping Guard and Reserve members and their employers understand their rights and obligations in employing members of the National Guard and Military Reserves. The Patriotic Award is given to employers who have demonstrated strong support of employees involved in the United States military on a part-time basis. Ward acknowledged that as one who has served in the military, specifically in the United States Marine Corps, he understands the importance of supporting members of the Guard and Reserve. “I am honored to receive this award, and I appreciate the sacrifices that Will makes in serving his country as an Army Reservist,” said Ward.